When I first heard about this cross-over from a friend of mine who reads a lot of comics and graphic novels, I know I rolled my eyes and said something unkind words about finding new ways to dig into people’s wallets. And when I saw the graphic novel available for review on Netgalley, I again rolled my eyes and sighed. But then I downloaded it. Why? Because DC/IDW hit on my two favorite pop-culture series’, that’s why. And clearly it must be the same for many, or they likely wouldn’t have done this. I’m a Trekkie/Trekker from WAAAAAY back. With some good friends, I published one of the original Star Trek fanzines (not many issues, but with a world-wide audience) so my affection for Star Trek is strong. And around that same time I was a pretty regular comics reader. In those days is was cool to read Marvel and not so cool to read DC, but of all the comics superheroes, Green Lantern was my favorite because anyone could be a Green Lantern (it’s the ring that has the power) and it relied on a person’s imagination to use the ring (and who has more imagination than some shy geeky kid who watches Star Trek and reads comics, right?). But still, combining these two series’ from very different worlds? How good could it be? After all, the last Star Trek comic I read/reviewed was only fair. But I was surprised at how much I enjoyed this. One of the last guardians of the universe is confronted with the death of everything, including the very universe itself. In a last-ditch effort to save something, the guardian performs something called “Last Light” which sends one ring of each color/power into a different universe for the sake of preservation. The rings and the decaying body of the guardian are found by members of the Enterprise, investigating the dead planet. The crew bring the body and rings aboard. When Scotty runs some experiments on the rings to determine their structure, the rings are activated and under their own power, zip off to find worthy beings. Three rings settle on members of the Enterprise crew (Bones, Uhura, and Chekov). The activation of the rings also acts as a beacon to other surviving ring-bearers who were also transported to this new universe by the act of Last Light. The Green Lantern Hal Jordan shows up to help the Enterprise stave off attacks by Romulan and Klingon ring-wearers. To complicate matters, Last Light not only flung the rings and the Lanterns to the new universe, but it sent Nekron – the bearer of death of the Lantern universe – to the Star Trek universe as well. Without the power of the White Lantern, how can anyone hope to survive? The story here actually works pretty well and very believably, given the two universes. (I should point out that the Star Trek universe is the one as imagined by J.J. Abrams and not the original series.) The balance of power is well done … the science of Star Trek compared to the ‘magic’ of the rings/Lanterns holds up pretty well. I liked that this was a story in which the Lanterns were transported to the ST universe and not the too-easy solution of having the Enterprise phase into some parallel universe.. The idea that Chekov received the Blue Lantern ring – the most powerful of the spectrum as it symbolizes Hope – was a little far-fetched for me, though if anyone on the Enterprise were to get that I suppose it makes sense. Still…that three members of the Enterprise, in all this universe were the most worthy…? There’s plenty of action and adventure here and the story moves along quickly. Too quickly. It’s rare, I think, that I would complain about a story moving along too fast, but this one definitely does. None of the sub-plots are really allowed to develop. (The sub-plots would be the yellow, orange, and red rings going to enemies of Starfleet and the Lanterns that follow those rings to teach the Romulan/Klingon/Gorn how to use them.) This moves more like an hour-long episode of Star Trek than a comic-book mini-series. Just as the action was building and I was really getting interested in everything, Kirk comes in and saves the day and the story is done. Another two issues wouldn’t have hurt this story, but actually would have allowed a little bit more to develop. It’s a graphic novel, so the art is a major component here and the art is very well done. Again…some of the better art in a Star Trek comic that I’ve seen. Kudos to Angel Hernandez. I am the target audience for a book like this, and I was skeptical at first, but came away very pleasantly surprised and actually thought that there should be more. But I do understand that if you are not the target audience (even if you come to this as only a fan of one of the two series here) then you may not enjoy this as much as I did. Looking for a good book? 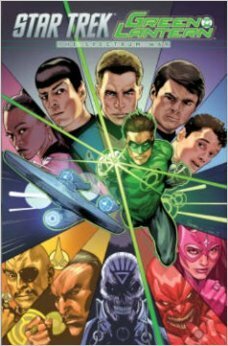 Star Trek/Green Lantern: The Spectrum War is a graphic novel tossing a popular tv/movie franchise in with a popular comic book series and the results are surprisingly effective, thanks to a strong writing hand and some really nice art.